How can board members best navigate the challenges and opportunities presented by climate change? Climate change is visibly disrupting business. It is driving unprecedented physical impacts, such as the increased frequency of extreme weather events affecting business infrastructure; it is also harming marine life and food supply chains. At the same time, policy and technology changes that seek to limit warming and reduce the associated physical impacts - when not applied smartly - can also cause disruption to prosperity, jobs and business. As with any form of disruption, climate change is creating and will continue to create risks and opportunities for business in a diverse number of ways. Investors, regulators and other stakeholders are now challenging companies to take responsibility by taking an integrated, strategic approach to addressing climate change. Boards of directors will play a critical role in this as they have the important duty of ensuring the long-term stewardship of the companies they oversee. On the one hand, good governance should already include effective climate governance. After all, climate change is simply another issue that drives financial risk and opportunity, which boards have an inherent duty to address with the same rigour as any other board-meeting topic. On the other hand, climate change is a new and complex issue for many boards that entails grappling with scientific, macroeconomic and policy uncertainties across broad timescales and beyond board terms. In short, general governance guidance is not necessarily sufficiently detailed or nuanced for effective board governance of climate issues. A new World Economic Forum report provides a guide to help corporate boards drive climate governance effectively. This was developed in collaboration with PwC and consultation with over 50 board members and corporate executives. Here are the key elements to which we would urge you to pay particular attention. Boards are accountable to shareholders for the long-term health of their organisations, so they are also responsible to shareholders for overseeing effective management of climate-related impacts. As a foreseeable financial issue within mainstream investment and planning horizons, climate change should enliven directors’ governance duties in the same way as any other issue prioritized at board level. 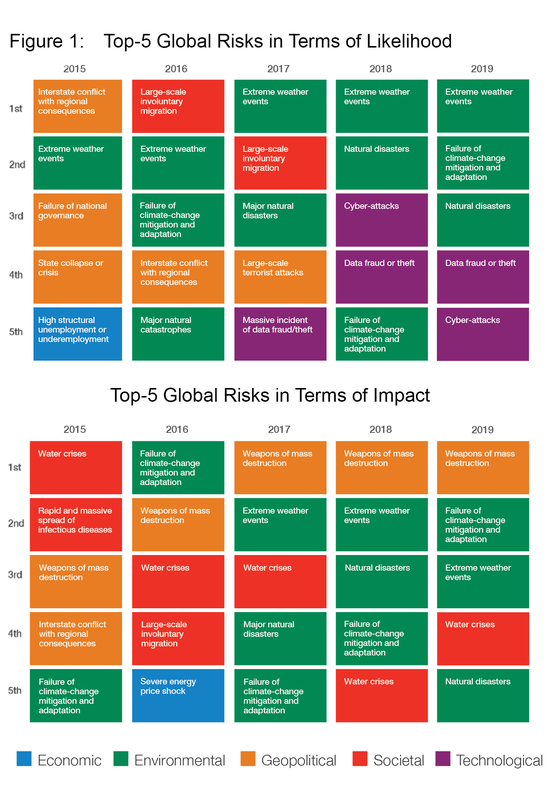 (see figure 1 on top macro-economic risks with highest impacts over a ten-years horizon). Uncertainty about the future impact of climate change on businesses makes it a challenging issue for board members to base decisions upon. But while the information available to directors is far from perfect, they remain accountable for identifying potential risks and opportunities - and they should use the best available information to boost their companies’ resilience in the face of a variety of different policy and economic outcomes. Therefore, management incentives should also be designed to align the interests of executive directors with the long-term health and resilience of the company. Given that corporate managers are typically incentivised on a vast number of topics, each board should consider how climate - and other sustainability and non-financial - targets can be integrated into existing incentives for managers, like DSM and now also Shell have introduced. In some cases, companies may have to reassess current compensation schemes to ensure that incentives are not counterintuitive or carry inappropriate risks that put the future value of the company in jeopardy. To cope with any major disruptions, boards should have sufficient collective awareness and understanding of the potential business impact of climate change - or at least have access to the expertise. Executive and non-executive directors can contribute to good climate governance in different ways. While non-executive directors may bring fresh perspectives on climate risks and opportunities, operationally accountable executive directors are expected to have greater insights into how climate is managed within the organisation. In any case, the board will set the tone for the company in this regard and can prompt greater responsiveness by senior management and staff - and it can even drive greater engagement. Boards also need to determine how to effectively embed climate into existing board and committee structures to enable adequate oversight of the issue. Given that board structures differ from company to company, there are obviously multiple ways to anchor climate into these structures – from standalone sustainability committees to integration into risk or audit committees, or via informal advisory boards. In any case, the structural design should enable sufficient scrutiny of climate as a financial risk and opportunity, and close interaction with the executive management. The impacts of climate change will vary from company to company. Therefore, companies need to assess the materiality of climate-related risk and opportunities so that the board can determine whether the management team's response is adequate. As climate change-triggered business disruptions may occur over a longer term than most corporate budgeting and reporting cycles, climate scenarios can help boards understand the potential business impacts under different time horizons and climate outcomes. The board’s positioning of the company on short-term decisions may have long-term and profound implications for the resilience of the organisation, so it is critical to consider how climate might alter the future business landscape. Long-term resilience may require fundamental and bold strategic changes of entire business models – just as Maersk, the world’s largest shipping company, has just announced. Thus, any corporate strategy put forward by the board should have integrated a range of potential climate scenarios in order to increase the directors’ confidence that their strategic decisions are resilient. Finally, holistic climate governance should entail adequate reporting and disclosure, including voluntary climate-related reporting, such as the TCFD. Many companies are unwilling to disclose the financial implications of climate-related risks and opportunities. This may be driven by concerns that detailed disclosure could reveal commercially sensitive information or make the company vulnerable to future legal action. However, in many jurisdictions, existing company and securities laws already require companies to report on climate change (where it is perceived as a material financial business risk). Current and emerging regulation may force companies to enhance their climate disclosures. Growing corporate and investor support for climate-related disclosure endorses our belief that material and decision-useful climate disclosure to investors and other stakeholders could help mitigate the risks of failing to report such relevant information. Integrated reporting can be an effective tool to communicate such a clear and concise picture of material climate risk and opportunity. It may also help the board to ensure consistency of the corporate climate messages spread externally. Any external corporate climate engagement should emphasise transparency and consistency across industry and policy activities. Where appropriate, boards should also work with investors on business transitions – individually or collectively via initiatives like Climate100+. These four elements are only a synopsis of the climate governance principles proposed by the World Economic Forum. While they cannot be taken as universally applicable, they should help to elevate the level of strategic climate thinking on boards and drive climate-smart and purposeful decision-making. In any case, boards should not lose their compass for humane and purposeful leadership. Together with the management, they should act as custodian stewards for profit, people and the planet. Such a culture of attentive and responsible governance is likely to generate trust with management, employees, investors and other stakeholders. It should also make the directors’ duty to govern climate risk more compelling on the road to building climate-resilient businesses. To address the climate risks and embrace the underlying opportunities, let us therefore close with a call to action from and for the most prominent corporate fiduciaries and catalysts for change - the board of directors. The report, How to Set Up Effective Climate Governance on Corporate Boards: Guiding principles and questions, is available here.